To the fly tyer, there are few things quite as exciting or for that matter daunting as the arrival of a new, and as yet empty, fly box. On the one hand it is a clean pallet, an empty canvas on which to exercise one’s own creative spirit. 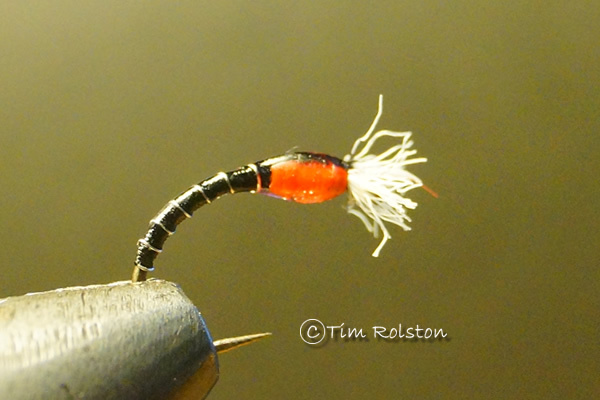 On the other, it is a mildly offensive empty space: the truly obsessive fly tyer finds empty space almost as upsetting as the slightly damp mishmash of left over and used flies that tend to populate fly boxes as the season progresses. What was once a lovingly fashioned and orderly array of neatly manufactured imitations degenerates over time into a haphazard collection of mangled wings, bitten off tippet and dare I suggest even a hint of rust? A woefully inadequate selection of the battle scarred and unwanted. Perhaps that is the real reason behind having a closed season on the streams. Nominally structured to provide the trout respite from our attentions, but perhaps more pragmatically offering time for anglers to sort out both themselves and their gear. Such is the way of things at the present, the cold fronts of winter have finally pushed north over the southern tip of the African continent, frigid conditions with rain and snow assail the mountains, the rivers are in flood and there is little left to occupy us other than stillwater trouting or perhaps the occasional trip north to tackle the flows of the Orange River and it’s healthy populations of hard fighting yellowfish. Winter is a time to batten down the hatches, search for those annoying leaks in the roof and perhaps tie some flies. My heart rarely skips an excited beat at the prospect of exploring the damp and dusty vacuum that is my home’s roof space and thus it has been to the tying bench that I have turned my attentions. 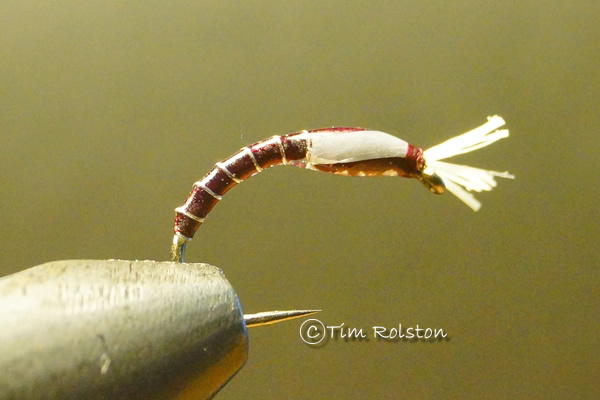 With few prospects of actually wetting a line and with the rain lashing against the windows it is hard to find the focus to tie size 20 parachute patterns that I know won’t see the light of day for months to come. 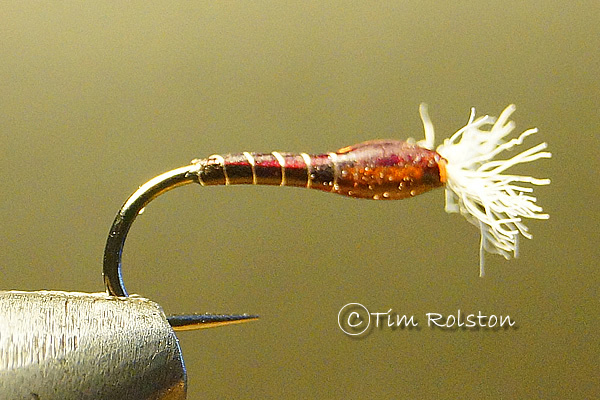 There is however at least some prospect of hitting a lake in relatively near future, and staring at an empty fly box with stillwater trout on my mind I decided to tie up some midge pupae (Buzzer) patterns. I don’t fish a lot of midge pupae really, although I do rather like to catch fish on them. For one thing, compared to a blob or a booby I like to imagine that the trout actually think that my imitation is real food. It is a matter of some degree of self-delusion that one prefers to think that one“tricked” the fish through one’s carefully strategized machinations rather than simply having annoyed the poor beast sufficiently to illicit a strike. Such delusions are of import to me; how I catch a fish is almost as critical to my psychological well-being as actually catching one. I far prefer fishing dry flies over wets, imitative patterns over lures, slow retrieves over stripping in streamers, floating lines over fast sinkers but this midge pupae thing might have got a little out of hand. According to numerous authors and scientific studies, stillwater trout eat more midge pupae than anything else, so I suppose that one can’t really have too many copies. I have even had some modicum of success using such flies, notably winning a hard fought competition session where many other anglers went home with dry nets, but as said, I don’t fish them that often. In these parts midge pupae are nowhere near as popular as they are in the reservoirs of the UK. So there I sat, winter chill in the air, my breath steaming in the glow of my fly tying lamp, the quite drip drip of that unattended hole in my roof adding staccato background noise; staring at an empty fly box with the previously mentioned mixed emotions of excitement and dread, contemplating my next move. That’s where the OCD kicked in: the fly box in question sported a foam insert and 168 slots designed to embrace my newly fashioned offerings. 168 slots, why the hell would I ever need 168 midge pupae? It is all well and good knowing that “stillwater trout eat more midge pupae than anything else”, but over a gross of the darned things, is that even remotely reasonable? The first dozen or so where classic red buzzers, sporting neat little mylar wingbuds and two tufts of poly yarn to imitate, or more specifically exaggerate, the breathing filaments of the real McCoy. Those I tied on straight hooks, midge pupae in real life aren’t always curved, and during hatching actually lie quite straight. Then I repeated the same pattern on curved hooks. That took care of two rows of slots, only 12 more rows to go. Trouble was, now I was committed. I suppose rather like a climber aiming to summit a particular peak, you tell yourself that the goal is in sight and that you will progress one step at a time. 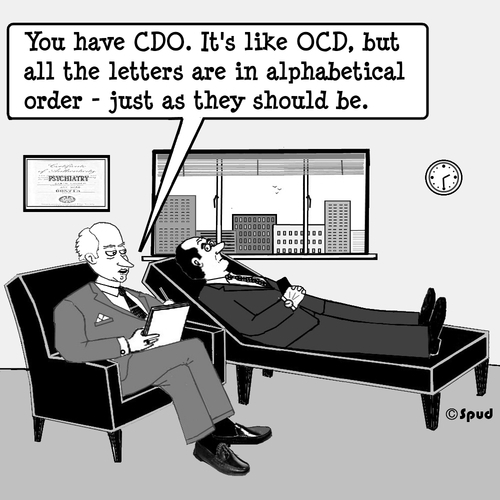 In my case more one slot or one row at a time. So tied some more in claret, claret has been a good colour for me in the past, particularly when fishing in the UK during my youth. 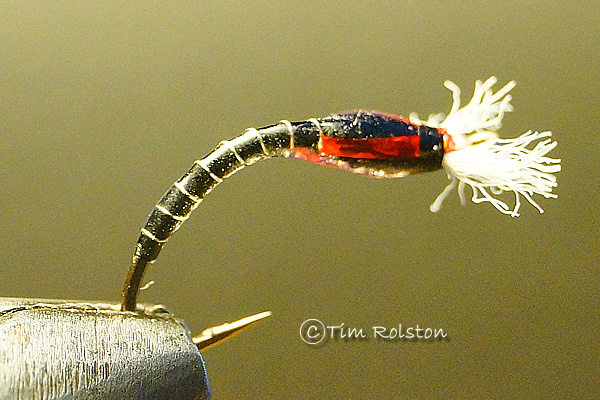 In fact they at least do have claret midges come off the water in the UK, I am not all together sure that such things even exist on what are now my home waters. It didn’t matter, I liked the colour and it took care of another row of slots, what with curved and straight versions, some with mylar wing buds, some with dental floss. Ah.. dental floss, that was a worthwhile experiment, an easy way to create prominent wing buds and the breathing filaments all in one go. Neat trick I thought as I waywardly contemplated that if I wished, I could even whip out a couple of patterns that were, at least nominally, “ spearmint flavoured”. You can see that I was beginning to lose my mind at this point and there was still more than half a box of lonely foam slots to go. 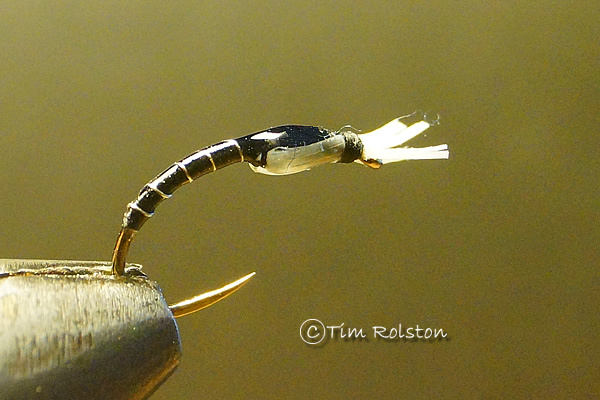 I experimented then with a few patterns tied not on standard curved hooks but on “English Bait Hooks”, those looked pretty neat, although perhaps larger than any real midge that might inhabit my local lakes. Still another row of 14 slots taken care of and I was inexorably progressing towards my goal of a full box of flies. By now however, the process was rapidly moving away from the practical goal of providing suitable imitations, should I actually get onto the water, and heading down the mental cul de sac of obsession. Those final slots, lying fallow for the present taunted me and I was determined not to be beaten. This weekend I finally girded up my loins for a last ditch effort to mix my metaphors and leap the final hurdle. The last row of 14 lonely foam slots, filled with newly fashioned gleaming sparkle pupae imitations. Chances are that I could manage on the water quite happily without a single midge pupa, my collection of smaller nymphs, Diawl Bachs and such would likely cover any significant hatches. Most of our stillwater fishing is during winter, and much of that time the fish are more occupied with mating than feeding. Frequently they are more likely to attack a bright lure, fished to annoy them, than they are to ignore their hormonal urges and intercept a diminutive , albeit carefully fashioned, upside down question mark. I mean would you disengage from athletic coitus to grab a peanut? Maybe it has been an exercise in futility after all, but it has kept me pleasantly occupied, and provided a level of satisfaction on completion. 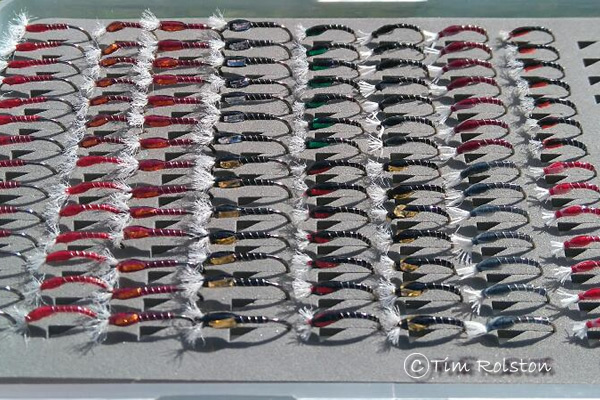 More’s the point, my fly tying of these patterns has improved, and just knowing that I have such a selection of weapons in my armoury will provide a level of confidence when on the water. I was once asked “why do you carry so many flies? – David slew Goliath with only three small stones”… to which I replied “Yes David might have only used three stones but he had a desert full to choose from”.. So yes having lots of flies does provide me with a level of confidence, which is important, and anyway you never know: I might even catch a trout on one of them. All done, 168 midge pupae imitations, a full box with no gaps and the OCD can take a break for a while.